Denki Blocks!, the multiple award-winning puzzler released in 2001 on Game Boy Advance, and then subsequently played millions and millions of times on handhelds, mobile phones and even interactive television, has finally found its way to the iPhone. 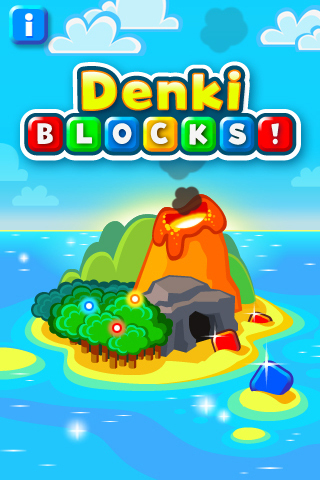 For those of you who have not played any of the game’s previous incarnations, Denki Blocks! is a puzzle game in which you must slide sticky blocks around a board and join the same colors together to solve puzzles. Sounds easy right? However, there are two important twists that make the game unique. First, all the blocks which are not fixed or obstructed will slide, and second, blocks of the same color will stick together when they touch. There are many different types of puzzles to solve, each with their own feel. Some focus on sorting while others may feel like you are defusing a bomb or dealing with lock mechanisms. The developer guarantees that all of them will get your neurons firing. There is a mix of puzzle difficulties to accommodate all skill levels, from beginners to experienced players. For anyone whose played a version of Denki Blocks in the past, approximately three quarters of the puzzles in this iPhone version can be considered ‘new’ (if you have only played the GameBoy Advanced version) and there are also new Challenges to achieve. Over 100 beautiful puzzles to enjoy, each hand-crafted for maximum pleasure. Complete over 100 Master Challenges to earn Denki Stars and open up secret puzzles. Enjoy our delightful audio or listen to your own soundtrack. Solve the puzzles to reveal pretty pictures.